Posted on June 11, 2016 by Alan Gerard. As the final week of the PHI Prototype experiment wrapped up, the weather pattern become favorable for active severe weather over the northern Rockies/Plains regions. This enabled our project to center real time operations over parts of northern Idaho and Montana, focusing on the WFO Missoula area on Wednesday and the WFO Glasgow area on Thursday. Wednesday evening’s primary severe weather threat was large hail, and hence forecaster and the EM/media groups focused on producing and using PHI for severe storms and lightning. Along with using product streams like MRMS, a key tool PHI HWT forecasters utilize in analysis and producing PHI is CIMSS ProbSevere. ProbSevere provides the initial probabilistic values for severe weather and lightning for storm objects – forecasters can then adjust the algorithm values when creating their PHI plumes. 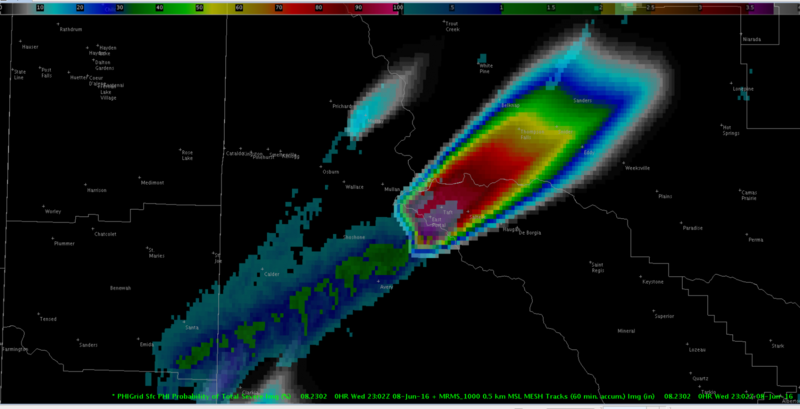 AWIPS 2 display of MRMS Maximum Estimated Hail Size swath overlaid with PHI plume forecasts of probability of severe thunderstorms, focused on a severe storm near Taft, MT. On Thursday evening, supercells moved across parts of central and eastern Montana producing damaging winds and large hail. 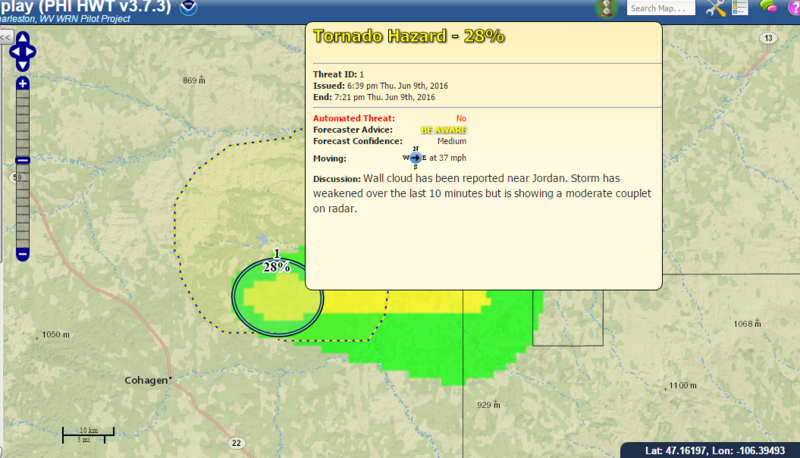 While conditions were not overly favorable for tornadoes, one particular supercell near Jordan, MT had a persistent wall cloud along with some reports of funnel clouds. Along with monitoring the typical severe weather data, HWT forecasters also were able to see realtime video and pictures from storm chasers in the region. This data was utilized to produce PHI for tornado potential, with most of the PHI objects giving information about lower probabilities than might typically be associated with tornado warning situations. The forecaster and EM/media groups then discussed how this probabilistic information might be utilized to help improve decision making and provision of severe weather information for the public. PHI plume for tornado probability for a supercell storm southeast of Jordan, MT. 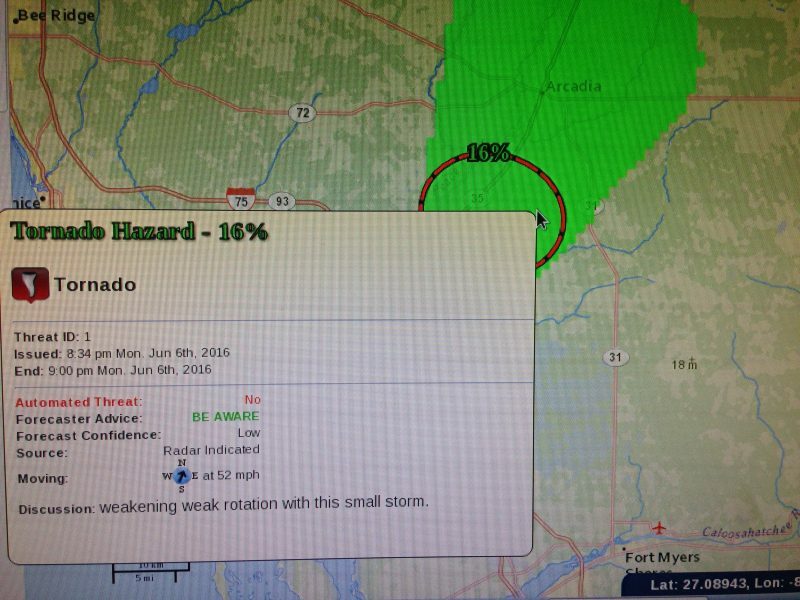 The text in the pop-up window is a potential text product based on NWS Hazard Simplification project prototypes. 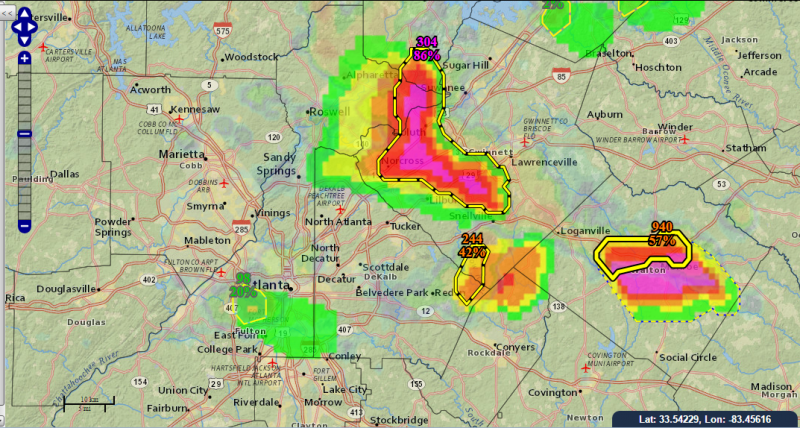 The yellow outlined box is the representation of a legacy severe thunderstorm warning derived from severe thunderstorm PHI data. Posted on June 7, 2016 by Alan Gerard. On the first day of the third and final week of the PHI Prototype Experiment, Tropical Storm Colin was impacting Florida during the afternoon hours when the initial shakeout operational session was underway. Hence, this region was selected as the operations area for the realtime period of operations. Forecasters generated probabilistic hazard guidance for potential tornadoes, damaging winds and lightning with squalls and convective cells moving across Florida in association with Colin. This included experimenting with producing lower probability tornado forecasts for small supercells which are common with landfalling tropical systems. PHI plume and associated NWS HazSimp based text for a squall with rotation east of Port Charlotte, FL. Emergency managers and broadcasters evaluated using the PHI to make decisions about realistic scenarios such as closing schools, cancelling events, etc.. During the end of day debrief, these users discussed potential pros and cons of the PHI paradigm for tropical cyclone situations along with the researchers and NWS forecasters. End of day debrief after HWT operations for Tropical Storm Colin. Not only do NWS forecasters and partners from around the United States participate in HWT experiments each spring, but meteorologists from around the globe also travel to Norman to be a part of efforts such as FACETs. These meteorologists are able to learn about the research going on at NSSL and OU and take that back to their own meteorological services, and also contribute their perspective and expertise based on the natural hazard services and warning systems in their own countries. During the week of May 13th, two meteorologists from Environment and Climate Change Canada observed and participated in the PHI-Hazards Services Experiment. These meteorologists work as forecasters at the Meteorological Services Canada Prairie/Arctic Storm Prediction Centre in Winnipeg. Along with observing the PHI-HS experiment, they also participated in the Storm Prediction Center’s Spring Forecasting Experiment, which includes among its research goals this year projects to examine methodologies to produce higher temporal resolution probabilistic outlooks for severe storms. The week of May 20th saw Mark Bevan of the UK Met Office participate in the PHI Prototype Experiment. Mark works as a Met Office Civil Contingencies Advisor, working to provide weather services and decision support to government officials in southwest England. Mark provided the experiment team with valuable perspective on the warning and hazardous weather support system in the UK, and also gained knowledge about FACETs which hopes to prove useful in developing and improving warning systems for short term weather hazards in the UK. 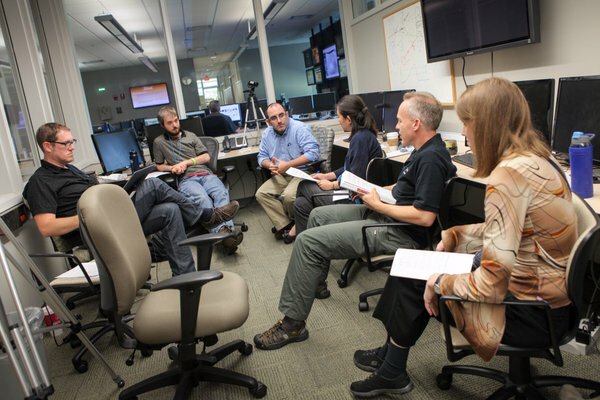 Mark Bevan from the UK Met Office (foreground) participates with NWS forecasters, broadcasters, emergency managers and researchers in an end of week debrief at the end of week 2 of the PHI prototype experiment. Posted on May 26, 2016 by Alan Gerard. For the concept of probabilistic hazard information to be a viable paradigm for providing severe thunderstorm hazard information, it must be able to be robustly produced and utilized for all different modes of storms. In this year’s PHI Prototype experiment, one of the historical cases being “worked” by the participants is a summer pulse severe storm episode from Georgia. Below is an example of radar and corresponding PHI guidance produced by a blend of forecaster and algorithm output toward the end of the event. In addition to the forecasters evaluating the benefits and challenges of the PHI system for these type of pulse events, EMs and broadcasters utilized the NWS EDD to display the data and make decisions about summer type related situations. For example, EMs utilized lightning and hail/wind PHI to make decisions about potentially evacuating large outdoor venues and adjusting airport operations. One tool that can be used on the EDD is the ability for the user to display a time series of the PHI probability values for a given storm, along with any reports of severe weather received. EDD display of time series of the PHI probability of severe weather with corresponding reports of severe weather. Posted on May 25, 2016 by Alan Gerard. The second week of the PHI prototype experiment kicked off on Monday, and swung into full gear on Tuesday with an active period of realtime weather. Evening operations focused on the tornadic supercells affecting the NWS Dodge City service area, and in particular the storm that produced multiple tornadoes in the immediate Dodge City vicinity. 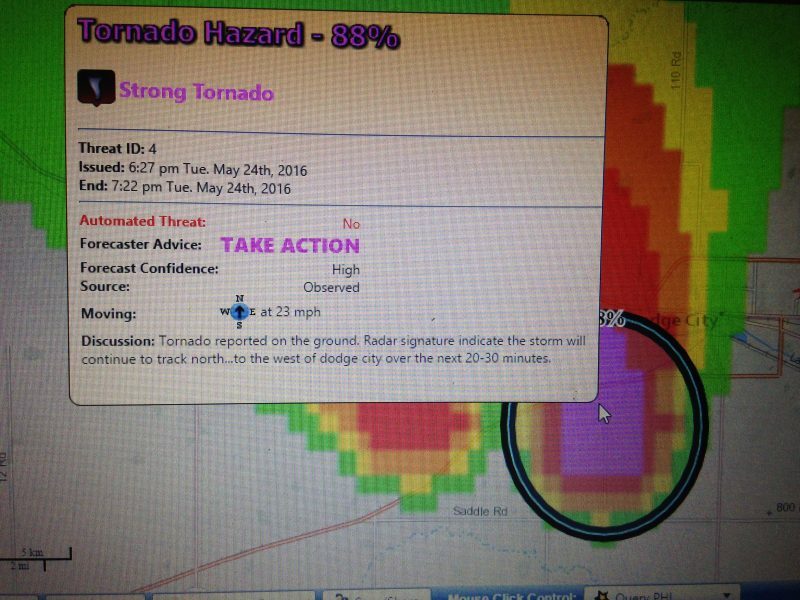 HWT probabilistic hazard plume for tornado to the southwest of Dodge City around 6 pm 24 May. Emergency managers and our broadcaster were “positioned” in the Dodge City area to perform job related tasks, and evaluate how PHI and associated text products based on the NWS Hazard Simplification project assisted in their decision making. The mock operations were quite realistic, with emergency managers making decisions about deploying search and rescue teams while additional storms were threatening, and our broadcast team conducting interviews with HWT forecasters about the storms. 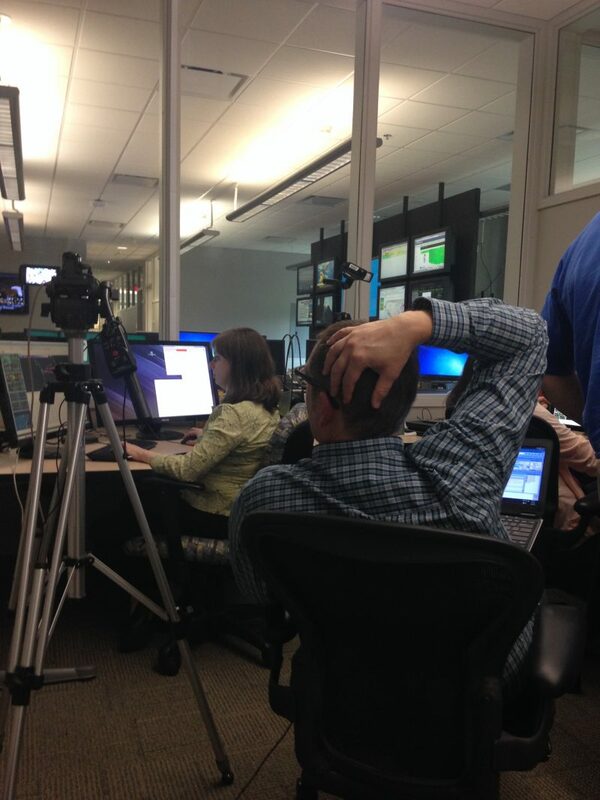 HWT forecasters monitored the live feed from our broadcaster, and also live chase footage via the Internet. 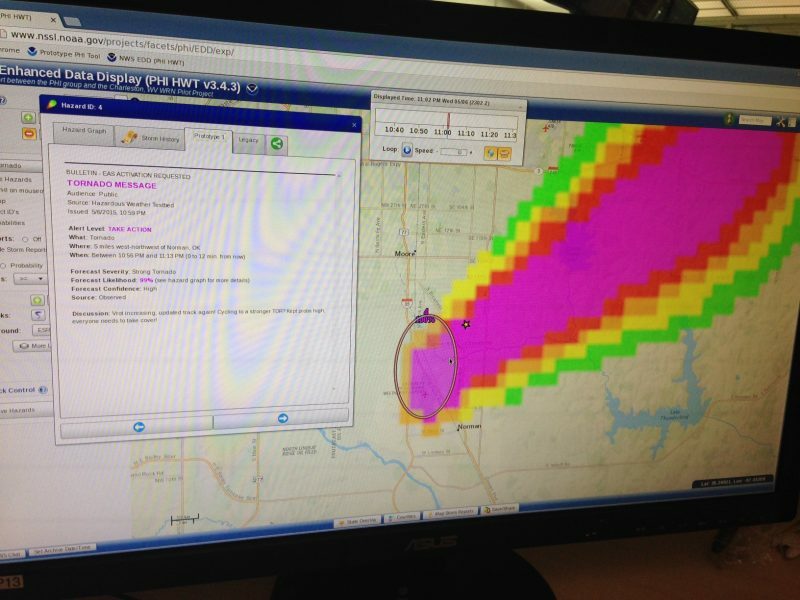 NWS EDD display of text popup window associated with PHI object for tornado just southwest of Dodge City around 6:30 pm. Posted on May 18, 2016 by Alan Gerard. NWS forecaster utilizing AWIPS Hazard Services to generate experimental PHI information for a realtime severe convective event over Florida. Video recorders record operations so that researchers can go back and analyze the forecaster’s actions during the experiment. This week is the second week of the PHI-HS experiment in the Hazardous Weather Testbed, in which two NWS forecasters are testing and evaluating the production of probabilistic hazard information (PHI) using AWIPS Hazard Services. 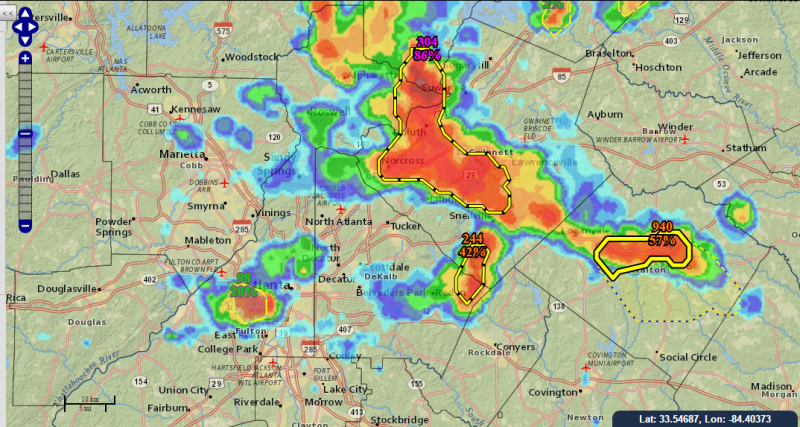 One of the important aspects being tested as part of this experiment is how to collaborate the production of PHI across more than one NWS County Warning Area (CWA). During two of the real time and archived weather events the two NWS forecasters work during the week, each forecaster was assigned a specific area of responsibility. As storms moved from one area of responsibility to another, the forecasters used NWSChat and Hazard Services to collaborate in an effort to produce consistent, accurate PHI for these storms. Researchers from NOAA NSSL and GSD, NWS Warning Decision Training Dvision, University of Oklahoma CIMMS, and the University of Akron will evaluate results from the experiment to examine the various technical and procedural issues surrounding effective collaboration. This testing will not only help examine coordination issues related to PHI production, but could also help provide insight into warning and forecast collaboration issues more generally. Posted on May 11, 2016 by Alan Gerard. The below picture shows an example of some of the products that emergency managers and broadcasters are evaluating this week for severe weather related decision making. Each day, NWS forecasters produce these products during two 60 to 90 minute periods – one based on an archived displaced real-time case, and the other a live weather scenario. Over the last two days, both of the live weather scenarios were in the lower Ohio Valley region. 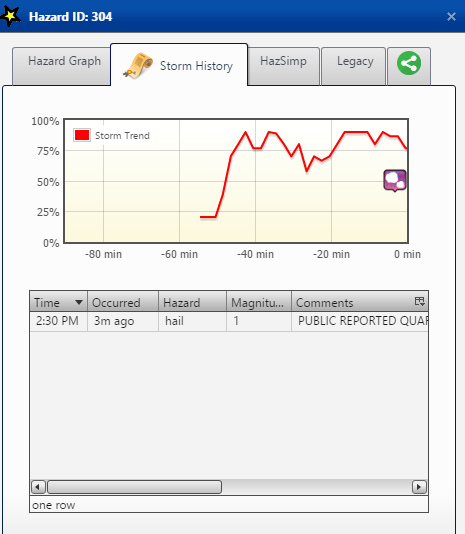 Example of tornado PHI “object” with corresponding probabilistic hazard plume, with a corresponding prototype HazSimp based message. While NWS forecasters are producing forecast information in the HWT, the EMs and broadcasters are in two separate rooms, analyzing and utilizing the forecast information in job related tasks. Using the NWS Experimental Data Display (EDD), developed by WFO Charleston, WV, the EMs and broadcasters can view not only the probabilistic hazard information in various graphical formats, but also prototype text-based messaging based on the NWS Hazard Simplification project. Social and physical science researchers are also in each of the three rooms, working on research goals that will help explore a number of the social and physical science issues related to FACETs. Posted on May 10, 2016 by Alan Gerard. 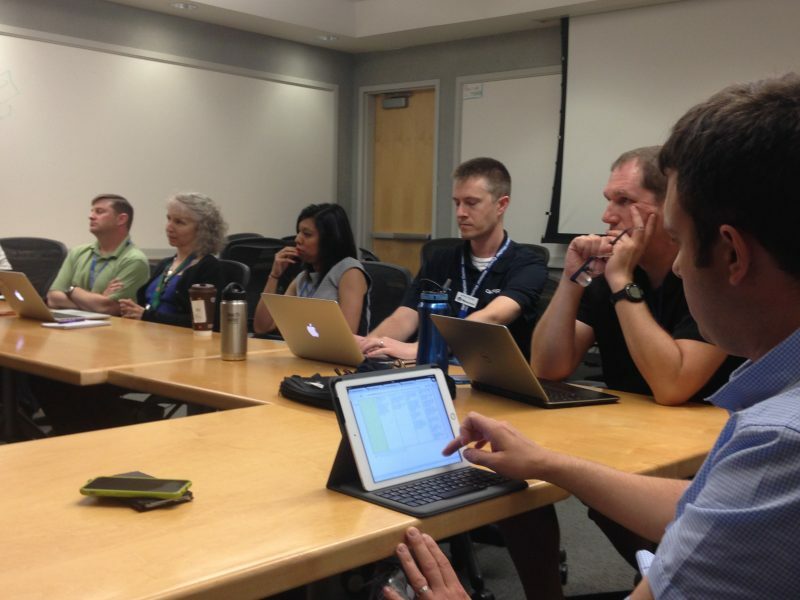 Monday was the first day of week 1 of the PHI prototype tool experiment in the NOAA Hazardous Weather Testbed. This experiment is bringing together NWS forecasters, NSSL and OU/CIMMS scientists, emergency managers, broadcasters, and social science researchers from around the country to investigate methodologies to produce and use probabilistic hazard information (PHI) related to hazards from thunderstorms. The image below shows the team in its initial orientation meeting. The team was going through initial orientation for PHI production and evaluation as severe storms were rapidly developing over central Oklahoma Monday afternoon. Forecasters produced test experimental PHI forecasts for the supercell that produced the intense tornado in Garvin and Murray counties during the mid afternoon hours as part of the group’s training in preparation for the more formal testing the rest of this week. This testing will go into full gear this afternoon, with the team working an archived case as well as realtime weather, likely focusing on expected severe weather either in the Ohio Valley region or in Texas. Posted on May 7, 2016 by Alan Gerard. This week saw the first full week of testing in the NOAA Hazardous Weather Testbed directly related to FACETs research and development efforts. Operational forecasters from NWS offices in Norman and Pittsburgh worked with scientists from NSSL, University of Oklahoma’s Cooperative Institute for Mesoscale Meteorological Studies (CIMMS), the NWS Warning Decision Training Division, and NOAA’s Environmental Sciences Research Lab (ESRL) to test software and techniques to generate probabilistic hazard information (PHI) utilizing Hazard Services software. Hazard Services is a software package being developed for NWS forecasters to use to generate hazardous weather forecasts. This week’s experiment thus not only tested the concepts of how forecasters can produce PHI guidance – it also enabled scientists and software engineers to evaluate the process by which it can be done using this software which will eventually be operational in the NWS. Two additional weeks of this experiment will be conducted later in May and in early June. This upcoming week (May 9-13) will see the first week of the PHI Prototype Experiment. 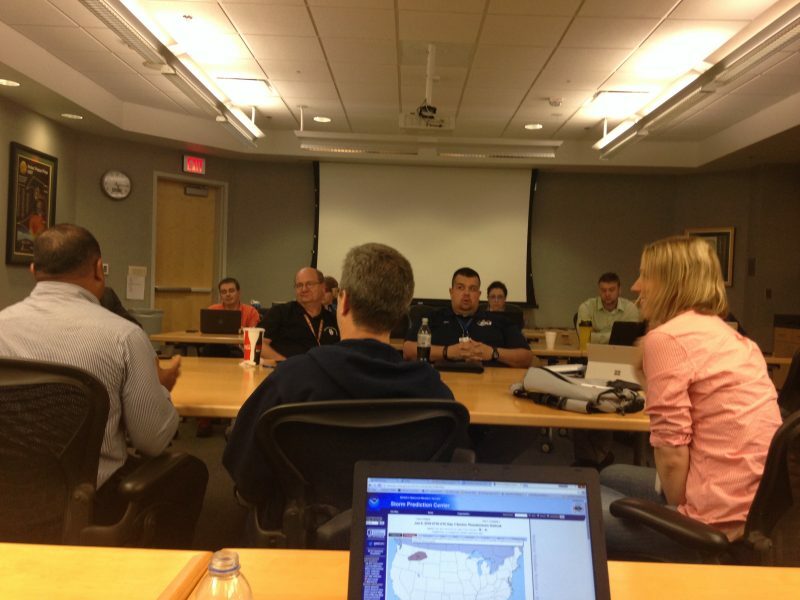 This experiment will bring together NWS forecasters, emergency managers, and broadcast meteorologists from around the country to work with physical and social scientists to test how PHI can be generated and utilized during severe weather events. We’ll be sharing updates from the experiment (and more information about FACETs and PHI) as the week progresses. Posted on April 22, 2016 by Alan Gerard. Welcome to the FACETs blog! We are planning to use this site to share the latest and greatest news and updates regarding NSSL’s FACETs related projects and research. Of particular note, over the next several weeks we will be sharing happenings from the Hazardous Weather Testbed Spring Experiment, which is now in full swing here at the National Weather Center in Norman. If you’d like to learn more about what FACETs is, please click here for more information, including videos and PowerPoint presentations you can review. This blog will be used by NSSL scientists working on FACETs related research and projects to provide updates and news related to this exciting effort to help improve the nation’s hazardous weather forecast and warning system.